This monster appears in the artwork of Triangle Ecstasy Spark and Harpie Lady Elegance. The individual sisters were later made into Harpie Lady 1, 2 and 3. Rose Whip and Cyber Shield appear in this card's artwork. This card's OCG/TCG artwork is loosely taken from Yu-Gi-Oh! Duelist - Duel 011, specifically from the panel where Harpie Lady is split into 3 duplicates via Kaleidoscope. Curiously, the TCG artwork leaves Harpie Lady 3s cleavage intact, despite covering them up as in other cases. The effect to "destroy 1 Spell or Trap Card on the field" of "Harpies' Hunting Ground" is mandatory, so it will activate even if "Harpie Lady" or "Harpie Lady Sisters" is Special Summoned during the Damage Step. 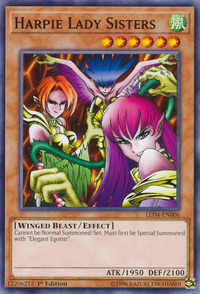 : Does the effect of "Harpies' Hunting Ground" which destroys a Spell or Trap Card activate even during the Damage Step? Harpies' Hunting Ground: If you control "Harpies' Hunting Ground" on your side of the field, because it is a Field Spell Card, it's effects apply to both players. When either player Normal Summons or Special Summons a "Harpie Lady" or "Harpie Lady Sisters" to the field, the controller of that newly-Summoned monster is the one who selects 1 Spell or Trap Card and destroys it. Triangle Ecstasy Spark: You cannot activate "Triangle Ecstasy Spark" if "Harpie Lady Sisters" is not on the field. You can activate it if the opponent controls a "Harpie Lady Sisters". In that case the ATK of the opponent's "Harpie Lady Sisters" will become 2700, but the opponent still cannot activate Trap Cards, and the effects of Trap Cards on the opponent's side of the field are negated. Triangle Ecstasy Spark: If there are multiple copies of "Harpie Lady Sisters" on the field, the ATK of each becomes 2700 until the End Phase.